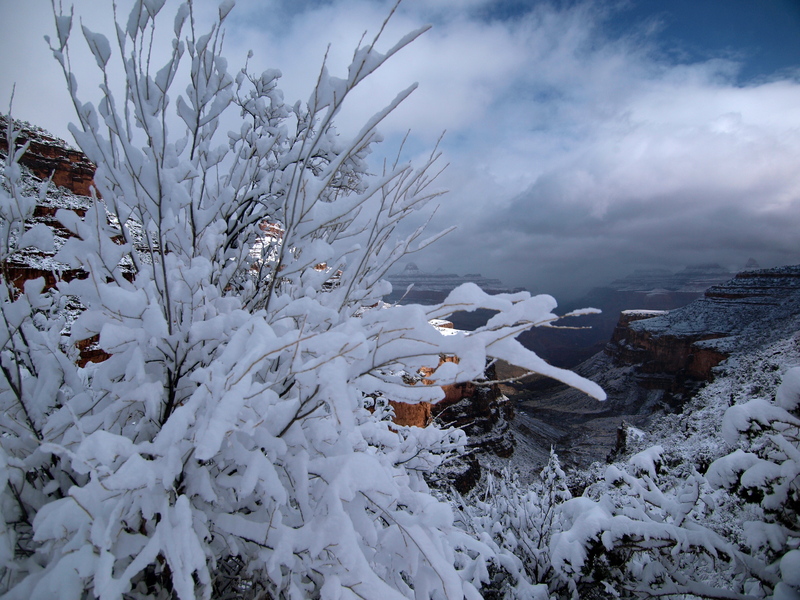 Grand Canyon: Day 5- Bright Angel Snowstorm! Last September, I visited the Grand Canyon for the second time in my life and a wintertime postcard in the North Rim gift shop convinced me I needed to see the Canyon in the snow. On the fifth and last day of my 30th birthday backpacking trip, I got my wish. Bright Angel Snowstorm. We were heading up through that gap in the cliffs. After a long, rainy, wet night in my beloved, but no longer waterproof, EMS Starlight II tent, we woke up at dawn, just in time to see the rain turn to snow. 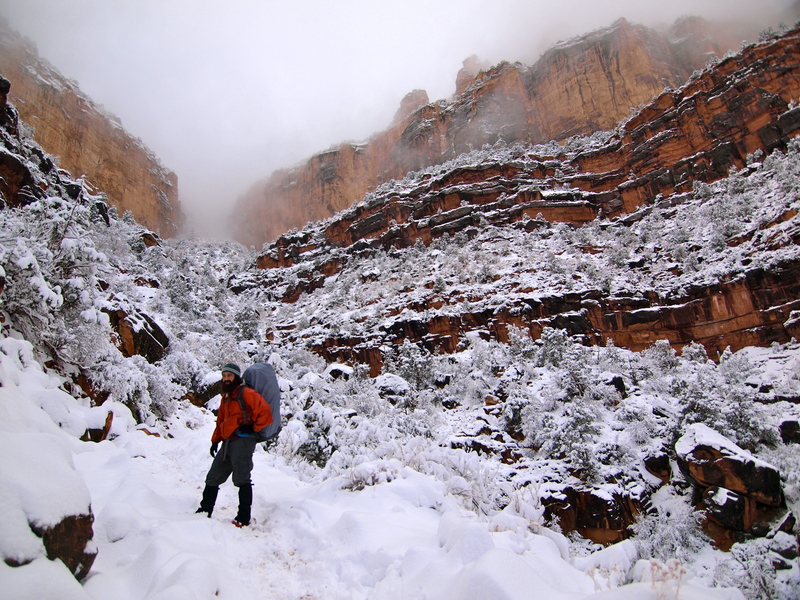 Instead of red towering cliffs, our camp was surrounded by a solid wall of white. 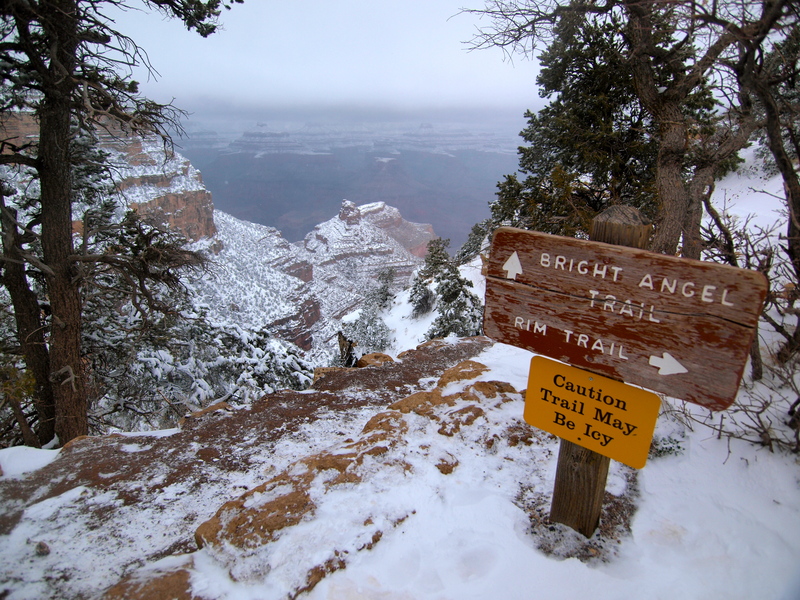 Thrilled, I rushed to pack up so we’d be the first to leave tracks in fresh Grand Canyon snow. Except for the leaky tent (I know, I know, I need a new one) we were prepared for winter weather. 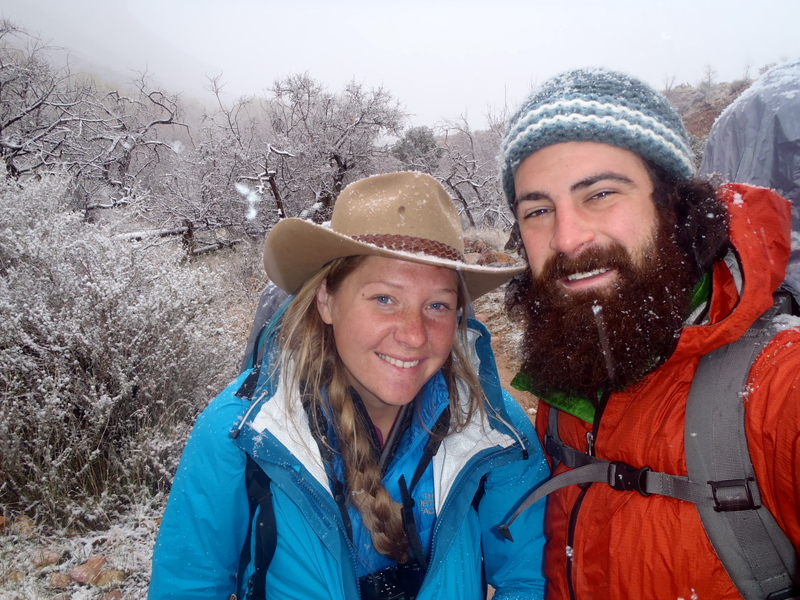 Donning all our layers, knee-high waterproof gaiters, ice traction cleats and waterproof pack covers we headed up the trail, into the storm. At 4.5 miles, the hike out of the canyon from Indian Gardens up the Bright Angel Trail isn’t long, but you gain more than 3,000 feet of elevation on the way up to the rim. Bright Angel gets deathly hot – many people have died on this trail from dehydration and heat exhaustion. Happy hiker! I'll take hiking in a snowstorm over hiking in the sun any day. Bright Angel is also notorious for crowds, but we had the place to ourselves. From the campground to the 3-mile Resthouse, we didn’t see anybody else. Then, I heard voices above us and smelled horses and five men on horseback appeared out of the storm. 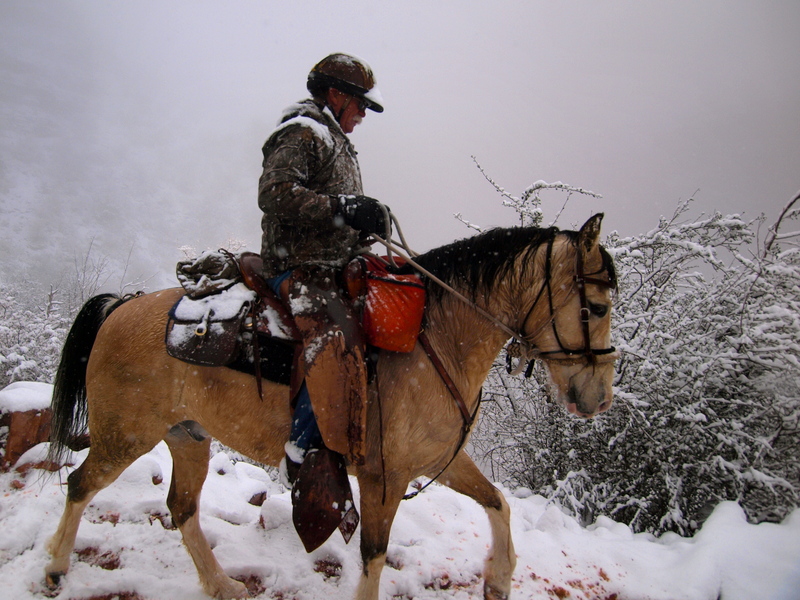 They all rode well; guides, not tourists, delivering supplies to Phantom Ranch. They asked us how far down the canyon the snow was falling and they were surprised to hear the storm reached all the way to Indian Gardens. In the inverted mountain that is the Grand Canyon, snow falls often on the rim (elevation 6,860 feet), but rarely at Indian Gardens (3,800 feet) and almost never at the river (2,400 feet). 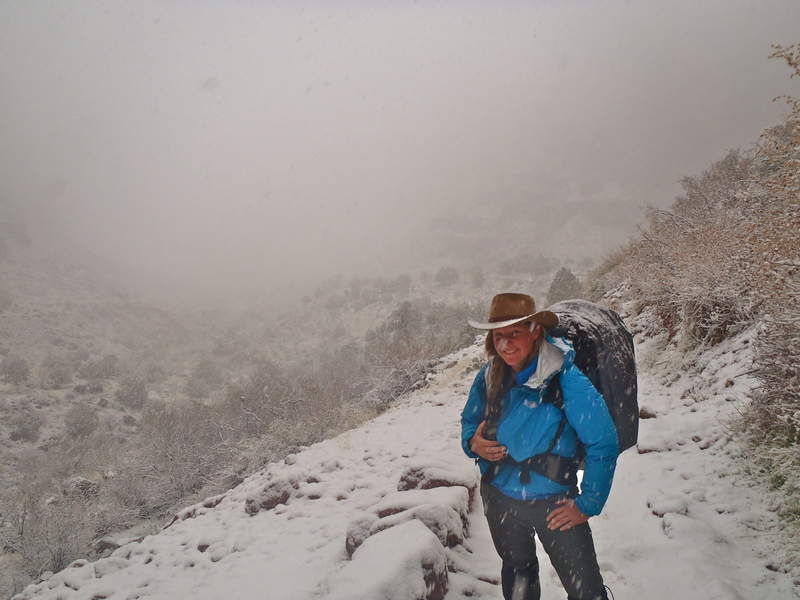 As we hiked up the trail, the snow began falling harder and the trail soon disappeared under several inches of powder. Even so, the well-worn switchbacks were easy to follow, especially once there were hoof tracks leading the way. 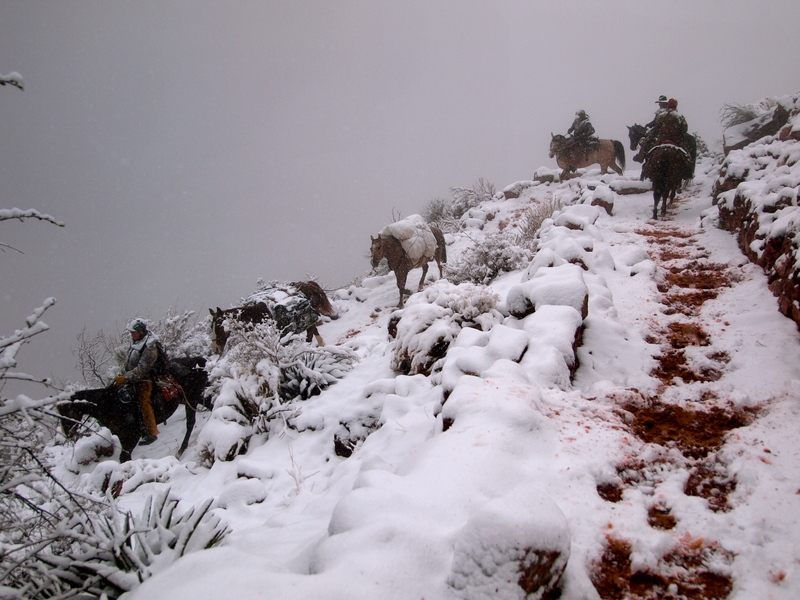 The Grand Canyon is famous for mules, but these guys all rode horses. Between Indian Gardens and the rim are two shelters, the Three Mile Resthouse and the Mile and a Half Resthouse. In the summer months, they’re both equipped with filtered, running water. 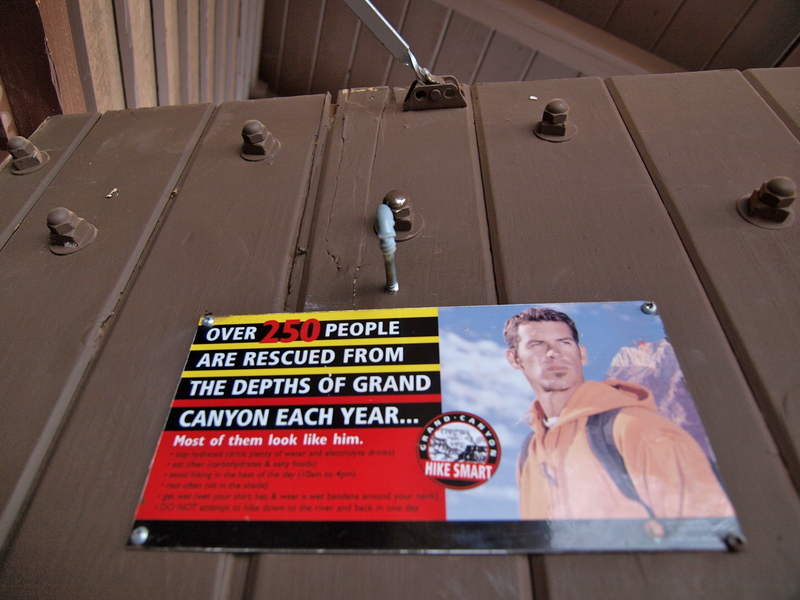 Year round, they provide a shady spot to sit and rest and a place to hang lots of scary posters warning of the dangers of hiking in the Grand Canyon. Rugged men need rescuing too. I love hiking uphill. After years of climbing mountains, I’ve got the legs and the lungs for uphill and I always delight in the way the views change as you move higher through a landscape. 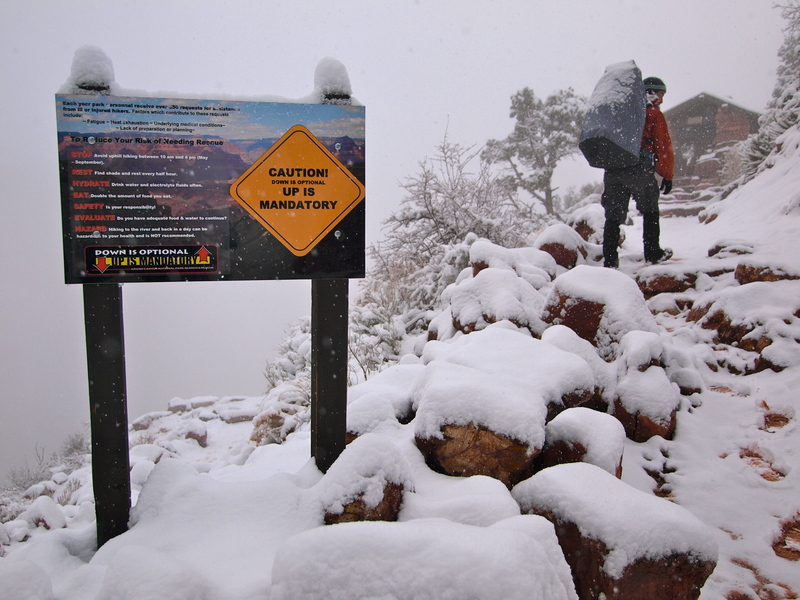 The climb up out of the Grand Canyon – in a snowstorm, no less – was awesome, in the truest sense of that word. We started in a total white out, but by the time we passed the second resthouse, the sky started clearing and we could finally see how far we’d come. Storm Clearing, Blue Sky. Indian Gardens is in the canyon below. One of my very favorite things about hiking uphill is looking back from a high vantage and figuring out my route over the landscape. From the top of Bright Angel, we had a clear view of our trek from Plateau Point, across the Tonto Bench to Indian Gardens and then up Bright Angel canyon to the rim. Usually by day five of a backpacking trip, I’m ready for a real meal, a hot shower and a night in a bed. Not this time. Every step I took up Bright Angel was a step closer to leaving the canyon and though my legs felt strong the whole way up, I dragged my feet and stopped often. Somewhere along the way, I made a vow to return next winter, for another trek. This is one of those places that will always call me back. I’ve now been out of the Grand Canyon for just over a week and I’m still in withdrawal. I’m acutely aware at all times that the Grand Canyon exists and that if I dropped everything, I could be back in that spectacular place in less than a day. Fortunately, my worries that the outside world would forever pale in comparison have proved unfounded – in my eyes, my big backyard is as enchanting as ever. All places are grand in their own way. But no place quite like the Grand Canyon. This entry was posted in Cowboys & Horses, Hiking!, Photography, Uncategorized, Vagabonding 101. Bookmark the permalink. 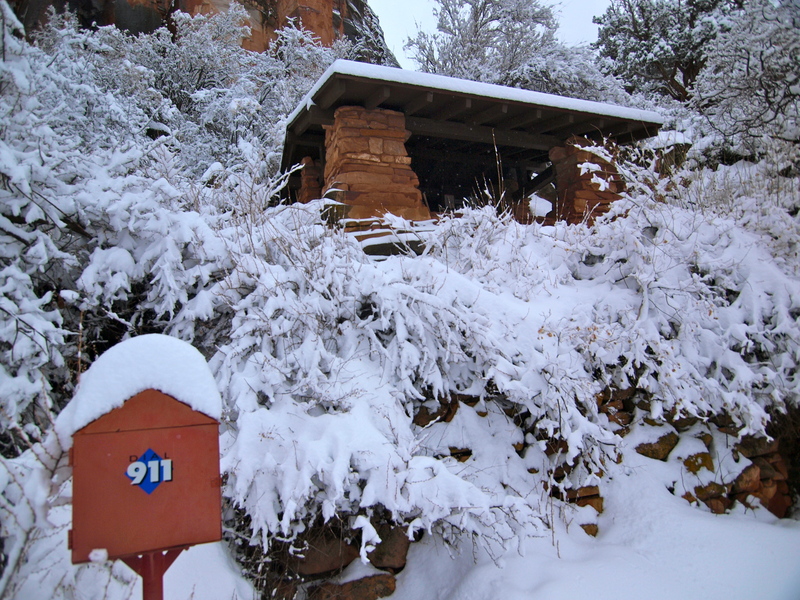 33 Responses to Grand Canyon: Day 5- Bright Angel Snowstorm! YOu have me very curious. It must be some place that used to covered with water. I forgot to comment on this post! I love the look of winter on the trails, but will you do the hiking. Wonderful images, now I really really really want to go, too! You are tough for going through it in the snow – hopefully I’ll get there this summer! These pictures are glorious. These photos are fantastic! Just mesmerizingly beautiful. Shameless promotion here for a fantastic, multi-tasking shampoo bar: my other blog for J.R.LIGGETT’S Shampoo bar: http://www.jrliggettsblog.com. What are you and your guy using for a combination shampoo/body bar/shaving/ and if needed, wash out an item of clothing? No SLS, 100% natural, made in USA. Biodegradable so use could use it in a mountain stream. Great post. You are lucky. But I think you know it.